It should be stated at the outset of this work, that Muslims do not seek to put down or desecrate the Holy Bible. It is a critical matter of faith for Muslims to believe in the original revelations that came down to Moses, David, Solomon and Jesus, just as it is important for Muslims to believe in the revelation of the Quran that came to Muhammad (peace be upon him). The key word here however, is "original." As we all know the origin of the Bible is clouded with centuries of copying, translating and passing down information, now long lost with only copies of manuscripts remaining to remind us of what once was the Bible. Additionally, it should be noted that Muslims do not seek to destroy the Christians or Jews belief in the Word of God, rather it is an obligation for Muslims to call to what is right and to halt that which is evil. Certainly, causing the "People of the Book" (as the Quran refers to Christians and Jews) to fall into disbelief and leave off any faith in God at all, is the very opposite of the direction Muslims should take in presenting any comparison between Islam and what has come down in the past from the Almighty God. We only seek to bring about more light to the people seeking guidance and pray for all of us to be successful with our Lord in this life and in the Next life and we ask His Guidance and Support in doing so, ameen. There exists today a number of different versions in the ancient Hebrew language of the Jewish Book called the Torah [Law] and this is usually referred to in Christianity as The Old Testament. Naturally, there have been many different translations to a great number of languages over the centuries and one could not expect them to be identical in text or meaning. What we have in English today still remains somewhat similar to large amounts of these older documents. There are also different versions of the Gospel or what is commonly called The New Testament in the Koine Greek language and Latin and these also have many translations to even other languages. Even amongst the English translations there are great differences. To mention two very clear differences for example; the Catholic Bible [c. 325 A.D] contains 73 books in total, while the Protestant Bible contains only 66 books, and although the newer (Protestant version) was taken from the Catholic Bible even then these books do not match completely with each other. There is no common denominator for any of the many different versions of the Bible. There have been a number of scrolls and parchments found in places surrounding what we call the "Holy Land" over the centuries, not the least of which are those often referred to as the "Dead Sea Scrolls" or as they are known to the scholars "Wadi Qumran Scrolls." These were discovered in the last century around 1930 and have been proven to be very ancient and could well be older than any other extant manuscripts. Much of what has been translated from these scrolls is similar to some of the oldest manuscripts, but there are still very important differences worthy of note. We would like to recommend some important reading on this topic at the end of this paper. The word "Quran" means "that which is recited; or that which is dictated in memory form." As such, it is not only a book, nor is it something that reaches us only in written form. The documentation in writing about the Quran has been preserved in museums throughout the world, including the Topekopi Palace in Istanbul, Turkey, the museum in Tashkent, Uzbekistan and also in England. The Quran is still printed up to this day with the verification and supervision of councils of scholars who have the Quran down to memory and who make sure there are no printing mistakes. There are no different versions of the Quran in the Arabic language, only different translations and of course, none of these would be considered to hold the value and authenticity of the original Arabic Recitation. The Quran is divided up into 30 equal parts, called "Juz'" (parts) in the Arabic language. These are learned by Muslims from their very early beginnings as children. The important thing to keep in mind about the Quran is the memorization and transmission of the actual "Recitation" just as it came to Muhammad (peace be upon him) from the Angel Gabriel and was learned and memorized by his companions and they in turn, passed it down to their followers and continued in this way until we see today, over 10,000,000 (ten million) Muslims who have committed the entire Quran to memory. This is not a small feat. After all, how many other works of literary value have been memorized and passed down through so many generations, in the original language, without a single change in even one sentence? All Muslims have memorized a portion of the Quran in the Arabic language, as this is an important part of their daily prayers. Many Muslims have memorized large portions of the Quran from one tenth to one half to all of the entire Quran, and all in the original Arabic language. It should be noted, there are over one and a half billion (1,500,000,000) Muslims worldwide and only about 10% are Arab, all the rest are learning the Quran in Arabic as a second language. The Quran contains clear statements from Almighty God (Allah) and it is Him speaking to all of us in the first person. He tells of us our own creation, the creation of all that is the universe and what has happened to those before us and what is to become of us if we do not take heed of the warnings clearly spelled out in His Revelation. He speaks also to Muhammad (peace be upon him) to show that Muhammad (peace be upon him) is not making this up himself and even chastises Muhammad (peace be upon him) for making human assumptions rather than waiting for revelation in matters (i.e. ; surah At-Tahrim and surah Abasa). The Quran refers to itself as "The Quran" (The Recitation) and mentions that it is to all mankind and jinn (another creation of Allah, similar to humans in that they could make choices as to whether or not they would obey God's Commandments, and they existed before humans). The Quran is clear on who God is and who He is not. There is no room left for doubt after reading the Quran in the Arabic language: God is One. He is the only Creator, Sustainer and Owner of the Universe. He has no partners. He has no relatives; wives, children or offspring. He is not like His creation and He does not need it for His existence, while all the time the creation is totally dependent on Him. His attributes are clearly spelled out as the epitome of each and every one. He is for instance, the All-Knowing; the All-Hearing; the All-Seeing; the All-Forgiving; the All- Loving; the All-Merciful; the Only One God. There is never a contradiction to this found anywhere in the Quran. "If this (Quran) were from other than Allah, you would find within it many contradictions." And yet, another challenge offered by Allah in the Quran is for the unbelievers to look around for evidences. Allah says He will show them His signs within themselves and on the farthest horizons. The scientific miracles of the Quran could not have been understood at that time, yet today we take for granted the many things included in the revelation of the Quran. Some include mentioning: The formation of embryo in the womb of the mother (surah 98); deep seas partitions; waters that do not mix; clouds and how they make rain and how lightning is caused by ice crystals; formation of the earth's mountains deep underground; orbits of planets and stars and moons - and even the mention of space travel (surah 55:33). 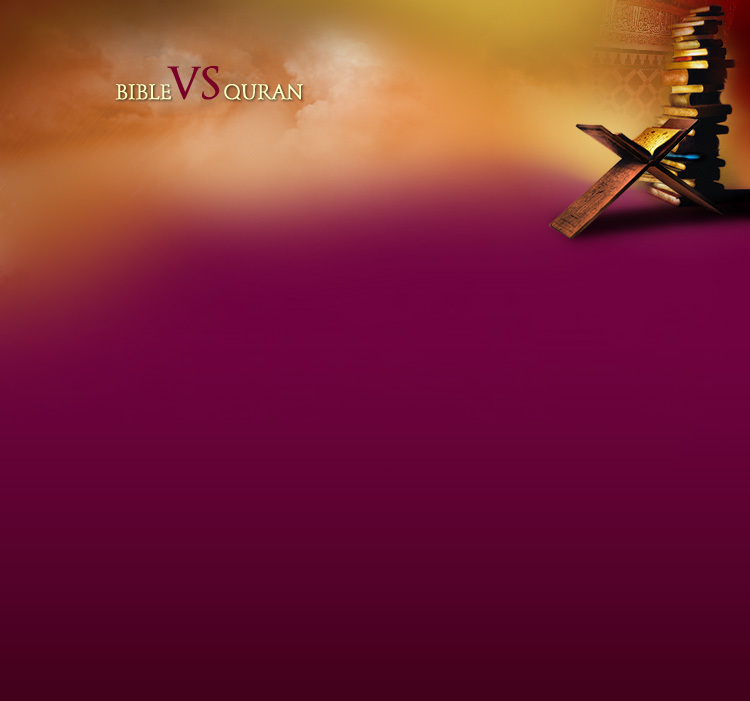 Whereas, The Bible is a collection of writings by many different authors, the Quran is a dictation (or recitation). The speaker in the Quran - in the first person - is God Almighty (Allah) talking directly to man. In the Bible you have many men writing about God and you have in some places the word of God speaking to men and still in other places you have some men simply writing about history or personal exchanges of information to one another (ex: Epistle of John 3). The Bible in the English King James Version consists of 66 small books. About 18 of them begin by saying: This is the revelation God gave to so and so� The rest make no claim as to their origin. You have for example the beginning of the book of Jonah which begins by saying: The word of the Lord came to Jonah the son of Elmitaeh saying� quote and then it continues for two or three pages. Compare this to the beginning of the Book of "Luke" begins by saying: �In as much as many have taken in hand to set in order a narrative of those things which have been fulfilled among us, (2) Just as those who from the beginning were eyewitnesses and ministers of the word delivered them to us, (3) It seemed good to me also, having had perfect understanding of all things from the very first, to write to you an orderly account, most excellent Theophilus, (4) That you may know the certainty of those things in which you were instructed. We see the author of the Book of "Luke" saying essentially, "Many people have written about things, it seems fitting for me to do so too.� "Luke" says it seems to him that as long as others are taking in hand to write something about it, even though they were eye witnesses to the whole thing, he feels that even though he was not, he still has "perfect understanding of all things from the very first." Therefore this is only a letter from one person to another, neither of whom knew Jesus (peace be upon him) nor were eyewitnesses to any of what had taken place. If you compare that to one of the four accounts of the life of Jesus, Luke begins by saying: �many people have written about this man, it seems fitting for me to do so too�. That is all� no claim of saying � these words were given to me by God here they are for you it is a revelation�, there is no mention of this. The Bible does not contain self-reference, that is, the word 'Bible' is not in the Bible. Nowhere does the Bible talk about itself. Some scriptures are sometimes pointed to in the Bible, say: Here where it talks about itself, but we have to look closely. 2nd Timothy 3:16 is the favorite which reads: �All scripture is inspired of God� and there are those who would say, here is where the Bible it talks about itself, it says it is inspired of God, all of it. But if you read the whole sentence, you read that this was a letter wrote by Paul to Timothy and the entire sentence says to Timothy: �Since you were a young man you have studied the holy scriptures, all scriptures inspired by God� and so on� When Timothy was a young man the New Testament did not exist, the only thing that stems he was talking about are scriptures � which are only a portion of the Bible - from before that time. It could not have meant the whole Bible. And if anyone takes away from the words of the book of this prophecy, god shall take away his part from the Book of Life, from the holy city, and from the things which are written in this book. �Let anyone who takes away from this book or adds to this book be cursed�. This too is sometimes pointed to me saying: Here is where it sums itself as a whole. But look again and you will see that when it says: Let no one change this book, it is talking about that last book, #66 (or is it #73 in the Catholic Bible? ), the Book of Revelation. It has too, because any reference will tell you that the Book of Revelation was written before certain other parts of the Bible were written. It happens today to be stacked at the end, but there are other parts that came after, so it can not be referring to the entire book. Note: The Book of Revelation was taken out of the Bible several times and then replaced and then taken out and replaced according to various Church Councils throughout Church history. Guess the Church Fathers didn't read the curse at the end of the book? It is an extreme position held only by some Christian groups that the Bible � in its entirety - cover to cover is the revealed word of God in every word, but they do a clever thing when they mention this, or make this claim. They will say that the Bible in its entirety is the word of God; inerrant (no mistakes) in the original writings. So if you go to the Bible and point out some mistakes that are in it you are going to be told: Those mistakes were not there in the original manuscript, they have crept in so that we see them there today. They are going on problem in that position. There is a verse in the Bible Isaiah 40:8 which in fact is so well known that some Bibles printed it on the inside front cover as an introduction and it says : � The grass weathers, the flower fades, but the word of our God stands forever�. Here is a claim in the Bible that the word of God will stand forever, it will not be corrupted, it won't be lost. So if today you find a mistake in the Bible you have two choices. Either that promise was false that when God said my word wont fade away, he was mistaken, or the portion which has the mistake in it was not a part of the word of God in the first place, because the promise was that it would be safeguarded, it would not be corrupted. I have suggested many times that there are mistakes in the Bible and the accusation comes back very quickly: Show me one. Well there are hundreds. If you want to be specific I can mention few. You have for example at 2nd Samuel 10:18 a description of a war fought by David saying that he killed 7000 men and that he also killed 40000 men on horsebacks. In 1st Chronicles 19 it mentions the same episode saying that he killed 70000 men and the 40000 men were not on horsebacks, they were on foot. The point is what is the difference between the pedestrian and not is very fundamental. Matthew 27:5 says that Judas Iscariot when he died he hung himself. Acts 1 says that, no he jumped off a cliff head first. If you study Logic very soon you will come in your course to what they call an �undecidable propositions� or �meaningless sentences� or statements that can not be decided because there is no contextual false. One of the classic examples sited is something called the Effeminates paradox. This man was Cretan and he said �Cretans always lie�, now was that statement true or false? If he was a Cretan and he says that they always lie is he lying? If he is not lying then he is telling the truth then the Cretans don�t always lie ! You see it can not be true and it can not be false, the statement turns back on itself. It is like saying �What I am telling you right now is a lie� would you believe that or not? You see the statement has no true content. It can not be true and it can not be false. If it is true it is always false. If it is false it is also true. Well in the Bible at Titus 1:12 the writer is Paul and he is talking about the Cretans. He says that one of their own men � a prophet - said �Cretans always lie� and he says that what this man says is true. It is a small mistake, but the point is that it is a human mistake, you don�t find that if you carefully examine the true content of that statement. It can not be a true statement. Now I come back to the Quran, and as I mentioned the speaker in the Quran is - in the first person - is God. The book claims throughout that it is the word of God. It names itself 70 times as the Quran. It talks about its own contents. It has self-reference. The Quran states in the first Surah after Fatiha that �This is the book, there is no doubt in it, it is a guidance for those who are conscious of God� and so on and so on� It begins that way and continues that way stressing that. And there is one very amazing statement in the Quran when you come to the fourth Surah 82nd Ayah which says to those who say Quran is something else than the word of God. It challenges them saying: �Have they not considered the Quran, if it came from someone other than God they will find in it many mistakes�. Some of you are students, would you dare to hand in a paper after you completed a research work or something at the bottom you put down there �You won't find mistakes in this�. Would you dare to challenge your professor that way? Well the Quran does that. It is telling: If you really think you know where this came from then starts looking for mistakes because you won't find any. Another interesting thing the Quran does is that it quotes all its critics. There has never - in hundreds of years - ever been some suggestion as to where that book came from but that the Quran does not already mention that objection and reply to it. Many times you will find the Ayah saying something like: Do they say such and such and so, say to them such and such and so. In every case there is a reply. More than that the Quran claims that the evidence of its origin is in itself, and that if you look at this book you will be convinced. So the difference in Christianity and Islam comes down to a difference of authority and appeal to authority. The Christian wants to appeal to the Bible and the Muslim wants to appeal to the Quran. You can not stop by saying: This is true because me book say it is, and somebody else would say something else is true because my book says differently, you can not stop at that point, and the Quran does not. The Christians may point to some words that it is recorded Jesus said and say this proves my point. But the Muslim does not simply open his book and say: No, no the Quran says this, because the Quran does not simply deny something the Bible says and say something else instead. The Quran takes the form of a rebuttal, it is a guidance as the opening says (Huda lil mutakeen). So that for every suggestion that the Christian may say: My Bible say such and such, the Quran will not simply say: No that is not true, it will say: Do they say such and such then ask them such and such. You have for example the Ayah that compares Jesus and Adam. There are those who may say that Jesus must have been God (Son of God) because he had no father. He had a woman who was his mother, but there was no human father. It was God that gave him life, so he must have been God�s son. The Quran reminds the Christian in one short sentence to remember Adam - who was his father ? - and in fact, who was his mother ? He did not have a father either and in fact he did not have a mother, but what does that make him? So that the likeness of Adam is the likeness of Jesus, they were nothing and then they became something; that they worship God. So that the Quran does not demand belief - the Quran invites belief, and here is the fundamental difference. It is not simply delivered as: Here is what you are to believe, but throughout the Quran the statements are always: Have you O man thought of such and such, have you considered so and so. It is always an invitation for you to look at the evidence; now what do you believe? The citation of the Bible very often takes the form of what is called in Argumentation: Special Pleading. Special Pleading is when implications are not consistent. When you take something and you say: Well that must mean this, but you don�t use the same argument to apply it to something else. To give an example, I have seen it in publications many times, stating that Jesus must have been God because he worked miracles. In other hand we know very well that there is no miracle ever worked by Jesus that is not also recorded in the Old Testament as worked by one of the prophets. You had amongst others, Elijah, who is reported to have cured the leper, raise the dead boy to life and to have multiplied bread for the people to eat - three of the most favorite miracles cited by Jesus. If the miracles worked by Jesus proved he was God, why don�t they prove Elijah was God ? This is Special Pleading, if you see what I mean. The implications are not consistent. If this implies that then in that case it must also imply the same thing. We have those who would say Jesus was God because he was taken up in the heaven. But the Bible also says a certain Einah did not die he was taken up into the heaven by God. Whether it is true or not, who knows, but the point is if Jesus being taken up proves he is God, why does not it prove Einah was God? The same thing happened to him. I wrote to a man one time, who wrote a book about Christianity and I had some of the objections I mentioned to you now. And his reply to me was that I am making matters difficult to myself, that there are portions in the Bible that are crystal clear and that there are portions that are difficult, and that my problem was that I am looking at the difficult part instead of the clear parts. The problem is that this is an exercise in self deception - why are some parts clear and some parts difficult? It is because somebody decided what this clearly means, now that makes this very difficult. To give you an example, John Chapter 14 a certain man said to Jesus: Show us God, and Jesus said: If you have seen me you have seen God. Now without reading on the Christian will say: See Jesus claimed to be God, he said if you have seen me you have seen God. If that is crystal clear then you have a difficult portion when you go back just a few pages to Chapter 5 when another man came to Jesus and said show us God and he said you have never seen God you have never heard his voice. Now what did he mean there if on the other occasion he meant that he was God? Obviously you have made matters difficult by deciding what the first one meant. If you read on in Chapter 14 you will see what he went on to say. He was saying the closest you are going to seeing God are the works you see me doing. It is a fact that the words �son of God� are not found on the lips of Jesus anywhere in the first three Gospel accounts, he was always calling himself the Son of Man. And it is a curious form of reasoning that I have seen so often that it is established from Bible that he claimed to be God because - look how the Jews reacted. They will say for example he said such and such and the Jews said he is blaspheming, he claimed to be God and they tried to stone him. So they argue that he must have been claiming to be God because look ! - the Jews tried to kill him. They said that�s what he was claiming. But the interesting thing is that all the evidence is then built on the fact that a person is saying: I believed that Jesus was the son of God because the Jews who killed him said that�s what he used to say ! His enemies used to say that, so he must have said it, this is what it amounts to. In other hand we have the words of Jesus saying he would keep the law, the law of Moses and we have the statement in the Bible, why did the Jews kill him ? Because he broke the law of Moses. Obviously the Jews misunderstood him, if he promised he would keep the law, but they killed him because he broke the law, they must have misunderstood him, or lied about him. When I talk about the Bible and quote various verses here and there I am often accused of putting things out of context, to say you have lifted something out of what it was talking about and given it a meaning. I don�t want to respond to the accusation as such, but it doesn�t seem to occur to many people that perhaps those who wrote portions of the Bible in the first place were guilty of the same thing. Maybe they � some of those writers - believed a certain thing and in order to prove it quoted from their scriptures � the Old Testament, the Hebrew writings - quoted out of context to prove their point. There are examples of that kind of thing. In Matthew 2 it said that a king wanted to kill the young child Jesus so he with his family went to Egypt, and they stayed there until that king died, and then they came back. When the writer of Matthew, whoever he was, because the name Matthew won't be found in the book of Matthew; when he described this event saying that he came back out of Egypt, he said: � This was to fulfill a prophecy which is written� and then he quotes Hosea Chapter 11 �Out of Egypt I called my Son�. So he said because Jesus went to Egypt and then came back out of Egypt and we have this passage in the Hebrew scriptures �out of Egypt I called my son� Jesus must have been the son of God. If you look and see what he was quoting, Hosea 11:1 he quotes the second half of a complete sentence, the complete sentence reads: �When Israel was young I loved him and out of Egypt I called my son�. Israel the nation was considered as the son of God. Moses was told to go to Pharaoh and say to him: If you touch that nation of people, you touch my son; warning him, warning Pharaoh: don�t touch that nation, calling the nation �the son of God�. So that this is the only thing talked about in Hosea 11:1. �Out of Egypt I called my son� can only refer to the nation of Israel. I mentioned this point some months ago here in another talk, to which a young lady with us objected that Israel is a symbolic name for Jesus. You will have a hard time finding that anywhere in the Bible because it isn�t there. You can take an index of the Bible and lookup the word �Israel� everywhere the word occurs and you will find no where in any place that you can connect the word Israel with Jesus. But never mind - suppose it is true, read on, the second verse says �and after that he kept on worshipping Bal�, because this is what the Israelites were guilty of, very often they kept falling back into Idol worshipping. So if that �Israel� really meant Jesus and it means that Jesus is the son of God that came out of Egypt they must also mean that Jesus from time to time used to bow down to that idol Bal. You have to be consistent, and follow through on what it says. So the point is whoever wrote Matthew and Chapter 2 was trying to prove a point by quoting something out of context, and he undid himself, because if you follow through on it, it can not be so. Now I can come back to the claim the Quran makes that it has internal evidence of its origin. There are many ways that you can look at this. As one example, if I single out somebody here and say: You know, I know your father - he is going to doubt that, he has never seen me with his father. He would say, how does he look like, is he tall short does he wear glasses? And so on, and if I give him the right answers pretty soon he will get convinced, �Oh yes, you did meet him�. If you apply the same kind of thinking when you look at the Quran, here is a book that says it came from the one who was there when the universe began. So you should be asking that one: So tell me something that proves it. Tell me something that shows me you must have been there when the universe was beginning. You will find in two different Ayahs the statement that all the creation began from a single point, and from this point it is expanding. In 1978 they gave the Noble prize to two people who proved that that's the case. It is the big bang origin of the universe. It was determined by the large radio receivers that they have for the telephone companies which were sensitive enough to pick up the transmissions from satellites and it kept finding background noise that they could not account for. Until the only explanation came to be, it is the left over energy from that original explosion which fits in exactly as would be predicted by the mathematical calculation of what would be this thing if the universe began from a single point and exploded outwards. So they confirmed that, but in 1978. Centuries before that here is the Quran saying the heavens and the earth in the beginning they were one piece and split and says in another Ayah : �of the heavens we are expanding it�. Let me tell you about a personal investigation, it occurred to me that there are a number of things you can find in the Quran that give evidence to its origin � internal evidence. If the Quran is dictated from a perfect individual; it originates with God, then there should not be any wasted space, it should be very meaningful. There should be nothing that we don�t need that you can cut off, and it should not be missing anything. And so that everything in there should really be there for a specific purpose. And I got to thinking about the Ayah which I mentioned before, it says, the likeness of Jesus is the likeness of Adam. It is an equation, it uses the Arabic word (mithel), it says Jesus, Adam, equal. You go to the index of the Quran, you look up the name ISA it is in the Quran 25 times, you lookup the name Adam it is there 25 times. They are equal, through scattered references but 25 of each. Follow that through and you will find that in the Quran there are 8 places were an Ayah says something is like something else, using this (Mithel), you will find in every case and take both sides of it whatever that word is look it up in the index and it will be lets say 110 times and lookup the other word and it will be said to be equal to the same 110. That is quite a project of co-ordination if you try to write a book that way yourself. So that everywhere you happened to mention that such and such is like such and such that then you check your index, filing system, or your IBM punch cards or whatever, to make sure that in this whole book you mentioned them both the same number of times. But that�s what you will find in the Quran. What I am talking about is built on a thing that is called in Logic: Use and Mention of a Word. When you use a word, you are using its meaning. When you mention a word, you are talking about the symbol without the meaning. For example, if I say Toronto is a big city - I used the word Toronto as I meant this place Toronto is a big city. But if I say to you Toronto has 7 letters, I am not talking about this place Toronto, I am talking about this word - Toronto. So, the revelation is above reasoning, but it is not above reason. That is to say we are more apt not to find in the Quran something that is unreasonable, but we may find something that we would have never figured out for ourselves. The author of this sentence said if this book came from someone besides God then you will find in it many Ikhtalafan (inconsistencies). The word Ikhtilaf is found many times in the Quran. But the word Ikhtalafan is only found once in the Quran. So there are not many Ikhtilafan in the Quran, there is only one - where the sentence is mentioned. So you see how things are put together perfectly. It has been suggested to mankind: Find a mistake. Man could not get hold of a mistake, and he is very clever, because this sentence could also mean: Find many Iktilafan and so he quickly goes to the index to see if he can find many of them and there is only one... Sorry clever person. Conclusion: Both the Bible and the Quran have come to us by way of Almighty God, then through His angel Gabriel and then to the prophets (peace be upon them). However, when the next step comes into play (that of the human beings faithfully transmitting it on to others and future generations) we find out that Allah has only preserved His Last and Final Revelation for all times. And He certainly did not need the humans to do that. Muslims should respect the Bible because it does still contain some of the original teachings of Allah. But there is no need to go to Bible classes or purchase one to read to try to learn about what our purpose is here in this life. The Quran makes it clear that Allah has indeed, perfected our "way of life" for us and has conferred on us His favor and has chosen for us to submit to Him in Islam. We would like to suggest to the non-Muslims to consider obtaining a Quran (order one free through our site if you like) and then investigate for themselves what the Quran is really all about and what it might mean to them in their lives. I would like to state that after years of studying the Bible and then learning the Arabic language to read the Quran as it was originally recited to Muhammad (peace be upon him) by the angel Gabriel, I have come to an amazing conclusion. It seems to me that the Bible and the Quran are most definitely from the exact same source and they compliment each other very nicely. In fact, it appears that the Bible does not contradict the Quran, except in the very same places where the Bible contradicts itself.